German Lutheran alchemist, physician and Rosicrucian apologist. Maier was a contemporary of Robert Fludd. He was the author of “Scrutinium Chymicum” (1687, a posthumously published abridgement of “Atalanta Fugiens”), which is included in Section 1 of the A:. A:. reading list. The early Rosicrucian movement was deeply involved with alchemy. While dismissed by modern scientists as an immature precursor to chemistry which dealt with the naive object of transmuting base metals into gold, alchemy was, in fact, a highly sophisticated symbol system which dealt with the quest for Harmony and Perfection through the application of the universal processes of nature on all conceivable levels– physical, psychological and spiritual: a process termed the Great Work. 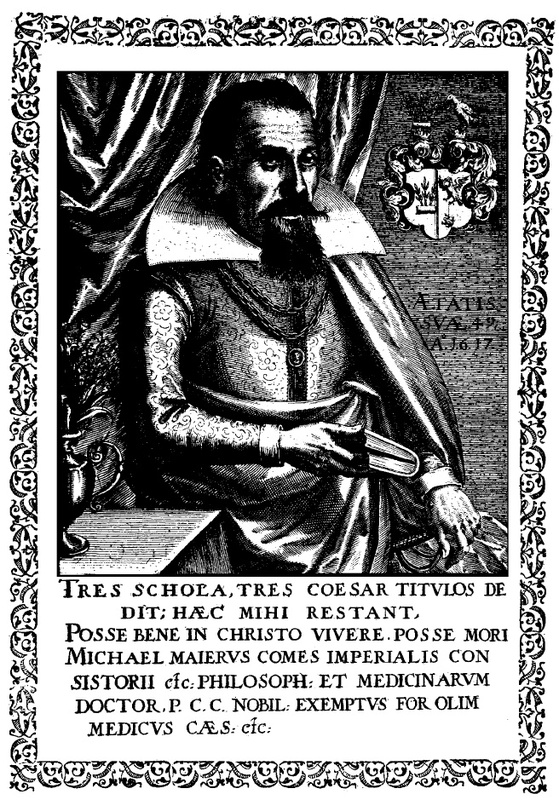 Maier was the author of numerous alchemical and Rosicrucian works, many illustrated with symbolic engravings of great beauty. These include Arcana Arcanissima (1614), Lusus Serius (1616), De Circulo Physico Quadrato (1616), Atalanta Fugiens (1617), Examen Fucorum Pseudo-Chymicum (1617), Jocus Severus (1617), Silentium Post Clamores (1617), Symbola Aurea Mensae Duodecim Nationum (1617), Themis Aurea (1618), Tripus Aureus (1618), Viatorum (1618), Tractatus de Volucri Arborea (1619), Verum Inventum (1619), Septimana Philosophica (1620), Civitas Corporis Humani (1621), Cantilenae Intellectuales de Phoenice Redivivo (1622), Ulysses (posth., 1624) and Subtilis Allegoria super Secreta Chymiae (posth., 1749).